It took me a while to use puppets in storytime. I was hesitant because this was something I didn’t learn about in grad school. Every professional workshop I attended about puppets had strict rules and Never Lists such as “Never leave a dead puppet” and “Never let the children see you and the puppet at the same time.” When I finally became comfortable with the job and performing in front of families, I ventured out into the puppet world, forgetting all of the nevers. It has worked for me and it can for you, too! Being a one-person children’s department I don’t have the luxury of “team teaching.” I also share my storytime space with the adult department who hosts authors, book talks, art openings, and I don’t have space to store a puppet theatre. I additionally do outreach to eight classes every month and like to share my puppet stories on the go. I wrote a post about creating Puppet Bins for Outreach, but I also use them in-house to store puppets in while I’m storytelling. (As seen in the video below, you can also use a basket–no fancy materials required.) Doing this kind of storytelling is freeing. I don’t have to worry about rules that the children don’t seem to care about. The children know that the puppet is a toy and isn’t “alive” and they know that I’m controlling it. Having these bins sets the story up, and it usually helps me expand a story. The children will see a barn and yell out animals I haven’t packed (so I can use them next time!). If you are too reluctant to try puppet storytelling, watch these stories to see how I adapt a picture book. You don’t have to use my favorite stories, choose your favorite book to try out. I like choosing picture books for a few reasons: 1) the children can take the story home 2) sometimes I tell the story using puppets, then read the picture book and ask them what differences they notice 3) if I lose my place, I can always open up the book and find where I’m at. 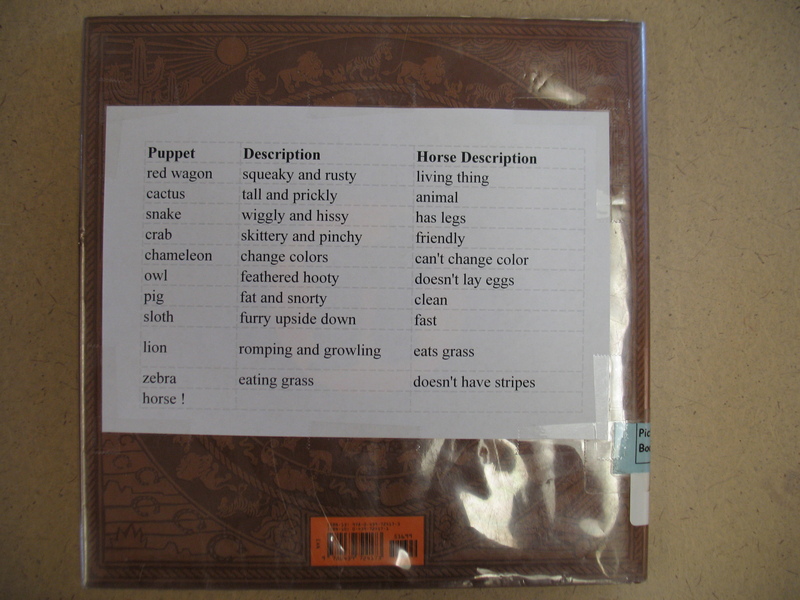 Tape an excel sheet to the back of the book with a “cheat sheet” of puppets in order of appearance with their important “line” in the story. 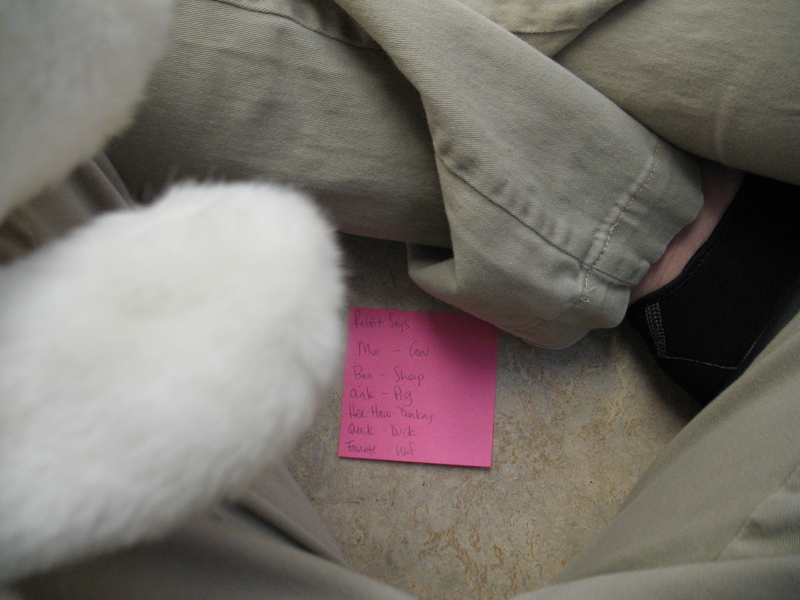 Use a sticky note with a cheat sheet of puppets in order of appearance that you can hide in your lap. Use the picture book in your lap and turn the pages as you tell the story using puppets. I always have cheat sheets for my storytelling. Telling it to your husband at home is much different from a storytime crowd! Sometimes I tape an excel spreadsheet to the back of the book and display it next to me as I storytell. Sometimes I write a Post-It Note and stick it between my legs. Sometimes I take the picture book and lay it in front of me and read it as I go. All of these tricks work well and no child is ever bothered by them. 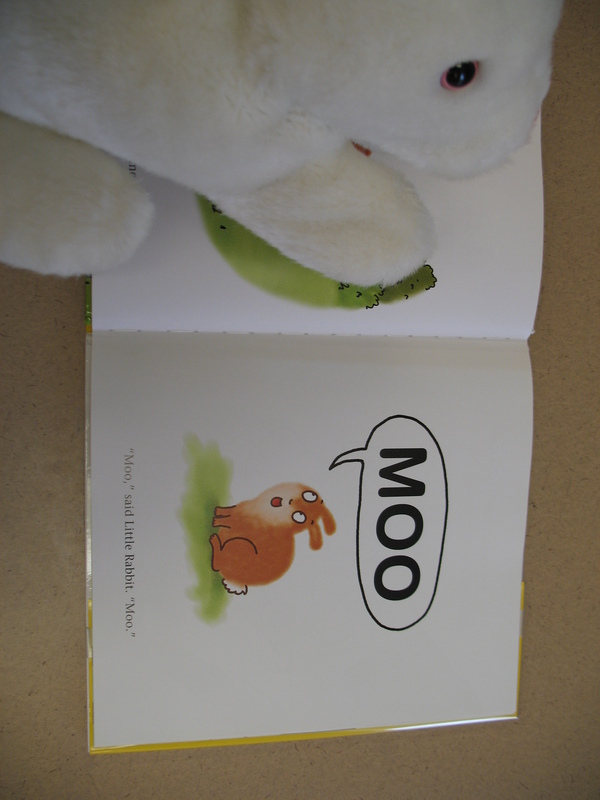 Reading along with the picture book shows the children that they can also storytell with their stuffed animals at home. So don’t be afraid! You can do it! For more storytime ideas check out Piper Loves the Library, she’s hosting Flannel Friday this week. What’s your favorite one-person puppet show story? I love the rabbit who says moo and I never thought of making word bubbles. Thank you! I need to make some word bubbles, yes!! This is a GREAT post! I have never had any sort of training regarding using puppets in story time, and I typically just wave around my farm animals while we sing Old McDonald. You have inspired me to think harder about possible new ways to use puppets. So thank you! Soooo clever!! Love the word bubbles! I agree about not worrying about “rules” with puppets. Especially with preschoolers who can be freaked out by puppets! I just discovered your site while looking for finger puppet activities, and I love it! You’ve created a wonderful resource here. My favorite one-person show stories are Book! Book! Book! by Deborah Bruss, Monkey and Me by Emily Gravett, Splash, Splash by Jeff Shepard, I Went Walking by Sue Williams, and for itty bitties, anything from Fiona Watt’s “That’s Not My…” series. Thanks, Kelly. It means a lot. How wonderful! I’m so glad there are librarians out there who blog about the stuff I’m always wondering about. You’ve given me courage to go out and try a lap puppet show with Arnold Lobel’s Small Pig, one of my all-time favorite books. Thank you! Oh, I’m so glad!!! You’ll be fine and the kids will love it. Let me know how it goes. Success! First lap puppet show was really fun for me and captivating for the audience. It was kind of a mixture between a puppet show and a felt board story (I used the felt board to do a little scene-setting), but all in all it went great. Thanks again! Awesome! What story did you tell?! My library does a big puppet show every year, and this year we’re doing “Interrupting Chicken,” which I’m ridiculously excited about. I’ll send you a link once we get some video! But I was mostly nervous about the small puppet show because our audience is now used to the big ones. Turns out the little shows are just as fun! This entry was posted on June 21, 2013 by mrsshaia in Outreach, Puppet Stories, Video Clips and tagged Outreach, Puppet stories, Video clips.